SENSATIONAL SNOWY DAYS in the swiss alps. Camp Suisse's Ski & Snowboard Camp for children and teens from all over the world - February 2020. 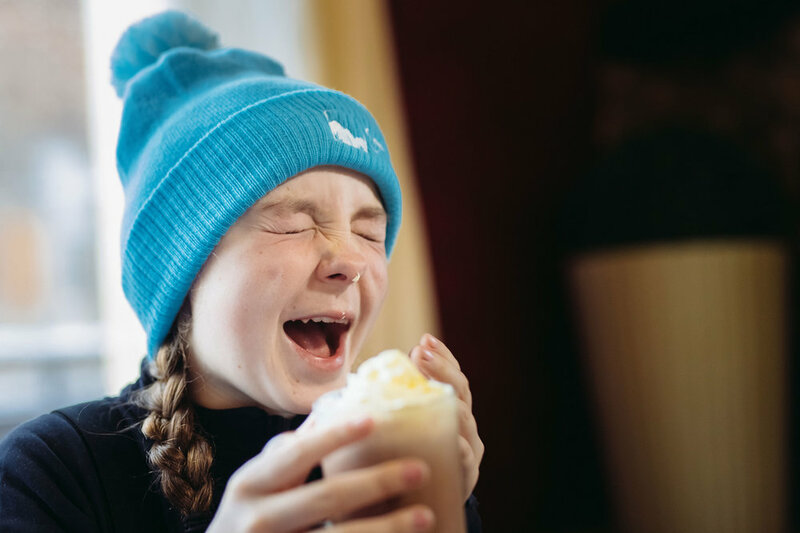 The Camp Suisse Ski & Snowboard Camp is the perfect way to make the most of the winter holidays - with a superb week of skiing or snowboarding in one of Switzerland’s finest resorts. Whether you are a beginner skier wanting to learn a new sport whilst taking in our amazing surroundings or a seasoned professional improving race technique and bumps, the Camp Suisse winter camp has something for everyone. 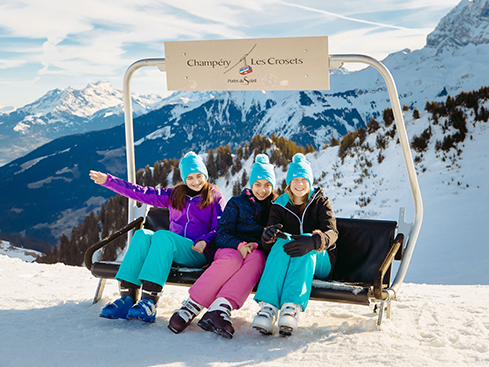 With accommodation in Champéry - which is situated in the Portes du Soleil region, nestled in the Swiss Alps - we offer a wealth of facilities that ensure our young people can improve their ski or snowboard skills in a serene, safe and clean environment. We pack as much fun as we can into each camp - whether that's carving up the slopes or throwing some shapes at the Camp Suisse Disco. We make sure everyone enjoys themselves - whatever their skill level. 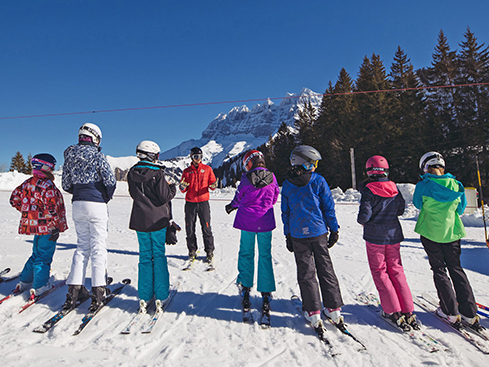 Throughout the week, campers enjoy five hours of ski or snowboard lessons per day (Monday-Friday) with our amazing instructors from the Ecole Suisse de Ski et de Snowboard. Our beginner lessons focus on the fundamentals of skiing and snowboarding, while those requiring more advanced lessons can work on fine-tuning different disciplines such as racing, bumps and off-piste. 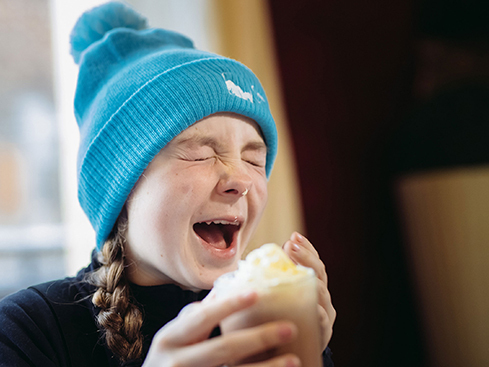 And it's not just skiing and snowboarding - we offer a full après ski and evening activity programme including a mountain safety course, ice skating, swimming, torch lit walk, sledging, disco, movie night and more. All sessions including freestyle, bumps and off-piste are conducted in controlled environments with qualified instructors from the Swiss Ski and Snowboard School. Off piste & variables - steeps and deeps! Return accompanied transfers from Geneva airport, Geneva Cornavin station or Aigle station are included in the camp fee (other arrival points available for a fee - please contact us). Simply give us your confirmed travel details in the run up to camp. We offer airport assistance on arrival and departure, along with accompanied transfers to and from camp. Campers should aim to arrive between 9am and 5pm on Sunday 16th February and depart after 7pm on Friday 21st February. Earlier departures can be facilitated. Camp Suisse offers accompanied travel by road from the UK (300 CHF per person (return). Various pick up points in the UK including Leicester, London and Dover. Campers are transferred by coach and cross-channel ferry or train. The journey is accompanied throughout by Camp Suisse staff. Depart Saturday 15th February 2020, return Saturday 22nd February 2020. Drop off and pick up your campers in person at Camp Suisse. Address: Palladium Champéry, Route du Centre Sportif 1, 1874 Champéry, Switzerland. Drop off anytime (8am-8pm) on Sunday 16th February 2020. Collect at 4pm Friday 21st February 2020. Full après ski and evening activity programme including mountain safety course, ice skating, swimming, torch lit walk, sledging, disco, movie night and more! Places are limited so book early for guaranteed shredding time. Places at the Ski & Snowboard Camp are allocated on a strictly first come first served basis. ...or fill in the form and we'll get back to you quicker than you can say lift pass. How many young people will be coming?